*Note-- Oatmeal can be baked 1 day ahead, covered and chilled. Blot any excess moisture from the surface, cover with foil, then reheat in a 325º F oven until warmed through, about 15 minutes. Preheat the oven to 350º F. Lightly grease an 8 x 8-inch baking pan or dish. In a small bowl, combine 2 tablespoons of light brown sugar and 1/4 teaspoon cinnamon; set aside. In a large bowl, combine the oats, granulated sugar, remaining 2 tablespoons of the brown sugar, baking powder, 1 1/2 teaspoons cinnamon, and salt. In a separate medium bowl, whisk together the applesauce, yogurt, milk, oil/butter, eggs, and vanilla. Pour the wet ingredients over the oat mixture and stir until completely combined. Pour the oatmeal into the prepared dish. Sprinkle the top with the brown sugar-cinnamon mixture. Bake for 30-40 minutes or until a wooden toothpick inserted in the center comes out clean. Remove from the oven and transfer to a baking rack to cool until warm, about 20 minutes. Cut into 6 rectangles or 9 squares. 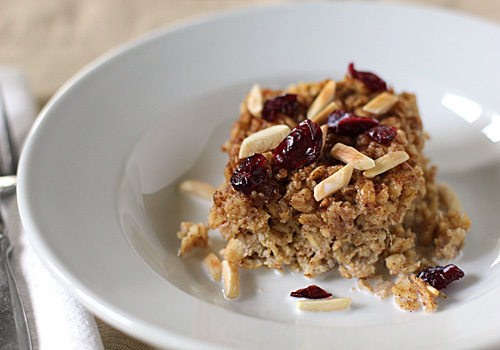 Serve warm with toasted nuts, chopped dried fruit, and warmed milk poured over top. Enjoy! I have never heard of baked oatmeal! It sounds perfect for these cool mornings we have started having. Baking it the night before makes it even more appealing. I can't wait to try it. Thanks for an exciting new recipe to try. I LOVE baked oatmeal. This one looks delicious! Okay well, this sounds like heaven in a bowl. My oldest is new to kindergarten this year and I've been keeping my eyes and ears open for breakfast ideas that are quick and healthy. This definitely fits the bill and I've already got all the ingredients on hand. Even a fresh batch of pear-sauce. Perfect. Any reason you can't add the nuts and dried fruits when you bake it? You can always make the recipe according to your own taste:) I prefer the chewiness of the dried fruit and the toasted crunchiness of the nuts after the oatmeal is baked, but you can certainly add them prior to baking if that is what you like. I even have variations with fresh fruit that I will share in the future. I tell my readers-- make it for you, make it your own. Best! Pleased-- I do hope you enjoy it! I love this!! I make it with 2 mashed, ripe bananas (prev frozen work great)instead of the applesauce, add a few cinnamon chips and bake in a sprayed muffin tin. When cool, I wrap them individually and freeze in a zipper bag. Great grab&go breakfast! Tried it for my family. Delicious!! Used apricots instead of cranberries and breakfast was yum! I made this for a pre-wedding dress shopping brunch. All the girls LOVED it! They all wanted the recipe so I sent it along. I served it with fresh strawberries and vanilla yogurt poured over top. Soo delicious! So very tasty and healthy! Add bananas and warm milk. I decrease the butter to make healthier. This has become a staple breakfast for our family.